FileHold Systems Inc. is the designer, and developer of FileHold document management software. The software saves companies time and money in electronic document management and helps ensure regulatory compliance. The software allows companies to implement a complete document archiving, organization and document recovery solution. FileHold software is used in all industries, including finance, legal, medical, construction and engineering, and by government agencies of all sizes. The software supports all popular document types. It also offers a powerful workflow component, and extensive security features. The company slogan “Document and Record Lifecycle Software” reflects the software's ability to manage documents from creation to disposal. Users can easily access the system using a standard web browser (both Internet Explorer and Mozilla Firefox are supported). It comes complete with all of the essentials customers need to manage document and record lifecycles. For fast searching within the latest version of FileHold, the company chose the dtSearch Text Retrieval Engine. “We selected dtSearch after conducting an extensive evaluation of full text search engines to replace a search engine we had previously used,” said Larry Oliver, President, FileHold Systems. See YouTube video showing searching in FileHold. 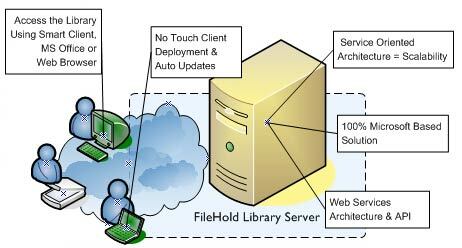 VANCOUVER, BC and BETHESDA, MD (July 12th, 2006) - FileHold Systems Inc. is a developer of advanced document and record management software. dtSearch Corp. supplies enterprise and developer text retrieval software. Both companies announce the release of FileHold’06, including the dtSearch Engine for Windows for searching document collections (scaleable to any size) in the FileHold’06 system. FileHold’06 document management software allows corporate and government customers to create, share and collaborate electronically on documents, while maintaining tight version control, managed workflow and high-level security. The result allows companies and governments to create a secure library for critical documents and records, and manage those documents throughout their lifecycle. FileHold’06 was designed and developed from the ground up as a result of the company’s many years in providing consulting services in the document management domain. The application is based on the Service Oriented Architecture (SOA) paradigm, allowing the software to scale to thousands of users and millions of files. The ability to search the library to find documents is an essential feature of document management software. FileHold has embedded the dtSearch Engine, for instant search and display of even the largest document collections. The dtSearch Engine can index over a terabyte of text in a single index--as well as create and simultaneously search an unlimited number of indexes. Indexed search time is typically less than a second, even across terabytes of data. The dtSearch Engine provides over two dozen search options. After a search, the dtSearch Engine can display retrieved documents with highlighted hits. The dtSearch Engine supports distributed or federated searching across multiple data sources, and includes access to dtSearch’s built-in Web Spider. FileHold Systems is a privately owned Canadian company that was formed for the purpose of developing FileHold'06. The company slogan, “Document and Record Lifecycle Software,” reflects the software's ability to manage documents from creation to disposal. For more information about FileHold Systems contact loliver@filehold.com. The Smart Choice for Text Retrieval® since 1991, dtSearch offers 20+ years of experience in text search and retrieval. The dtSearch product line includes enterprise and developer text retrieval products, meeting some of the largest-capacity text retrieval needs in the world. dtSearch products have received multiple awards and hundreds of excellent press reviews and case studies. The company also has distributors worldwide, including coverage on six continents.